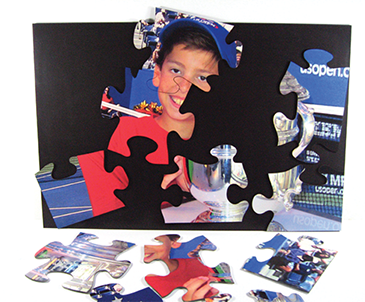 Custom Photo Puzzles let you choose the size, shape, and number of pieces. "THAT IS ONE AWESOME PUZZLE!!" 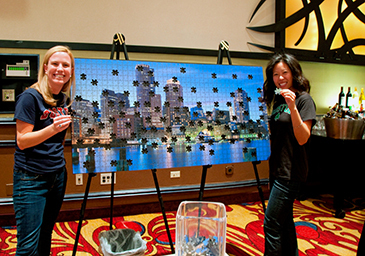 "I wanted to share this time lapse video of the puzzle – it turned out great!" 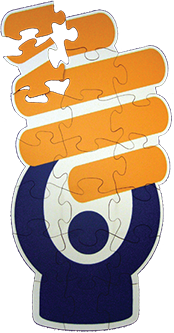 Fotoforms can make GIANT puzzles for maximum impact. 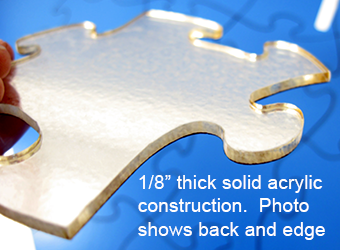 We can make truely interlocking puzzles of ANY SIZE, with small or large pieces. Excellent for team building events, your corporate lobby or rec room wall, or just big fun. 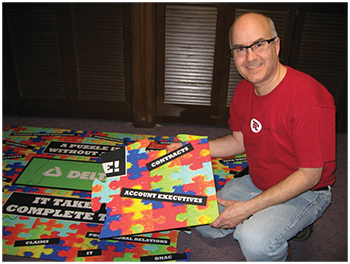 See our Parties and Events Portfolio Page for lots of Giant Custom Puzzle examples. 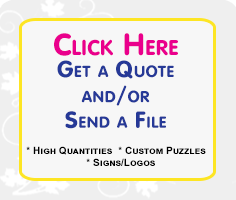 Your Custom Puzzle doesn’t need to be rectangular! We can make your puzzle in the shape you choose. Check out these custom shaped puzzles we’ve made in the shape of the state of Illinois and another we made in the shape of a lightbulb. Note the tape measure next to the IL puzzle shows this is a giant, 4 foot custom puzzle! 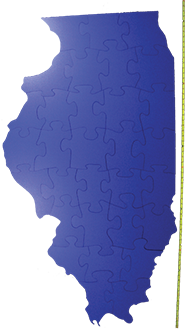 Choose the shape of one or more pieces in your custom puzzle. 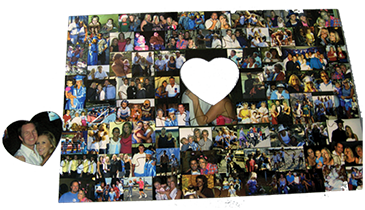 Your special shaped piece can be in a logo shape, heart, trumpet, or we can cut around a feature in your image. 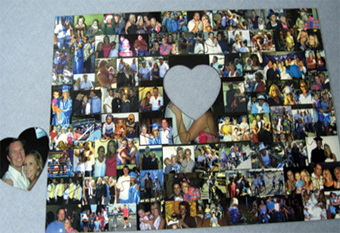 This large, 20 x 30 inch photo puzzle has a heart shaped central piece. Say you have exactly 35 employees coming together for a meeting, and you want each to have one piece of a puzzle they can assemble as a team to signify their importance in the overall “picture” of your company, or you need exactly 13 pieces to replace candles for your Bar Mitzvah “candlelighting” ceremony; just let us know. 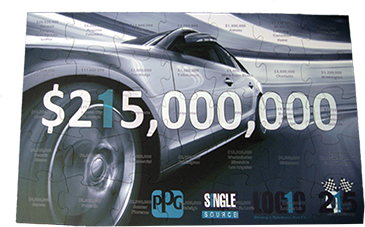 Imagine your giant puzzle magnetically assembled on the wall of your lobby, trade show booth, or rec room. We can add magnets to the pieces so you can mount your puzzle to any wall painted with magnetic paint (available at most home improvement stores). We also offer magnetic assembly trays up to 20 x 30 inches (see below). 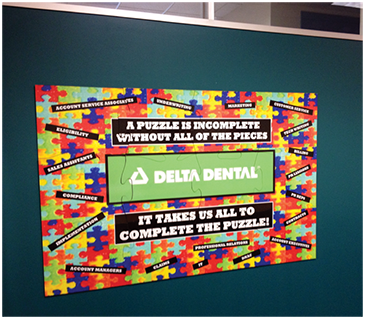 At right is a 4 x 7 foot wall mounted puzzle we made for Delta Dental. For puzzles up to 20 x 30 inches, an assembly tray allows you to display your puzzle on an easel or wall, and lets guests watch it being assembled. The trays have a magnetic surface and keyhole slots on the back so you can hang your beautiful puzzle on your wall for display. We can make your puzzle with commonly interlocking pieces, meaning all pieces are the same shape and fit each other regardless of postion. A great way to show your team they are all part of the bigger picture. 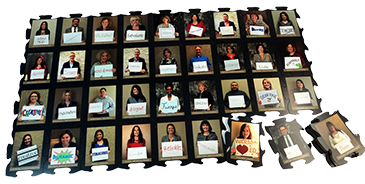 Here we've imported employee photos into each piece and the customer displays the puzzle on an "employee wall" that can be added to or subrtracted from over time. 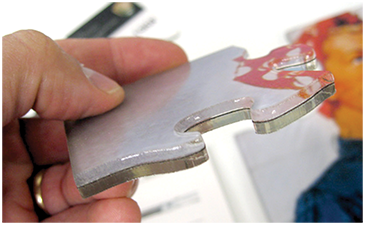 For really rugged use, we can sandwich your image between layers of acrylic. This is a common option for museum puzzles. 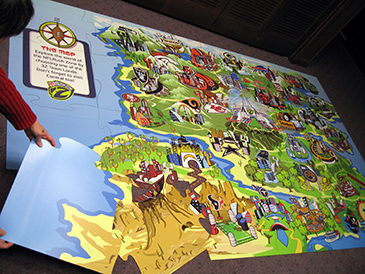 A puzzle we made for the Miami Museum of Science has stood the test of OVER 1 MILLION VISITORS and is still in use today! Yes, you can write on our puzzles. Great as a unique guestbook, or for teambuilding/brainstorming sessions. Let us know if you want a writable puzzle so we can suggest a luster or matt laminate, which is more receptive to writing then gloss. 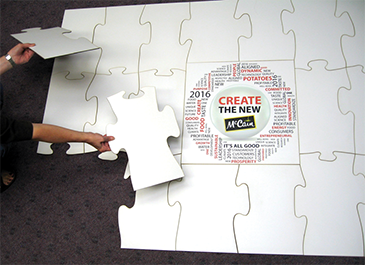 This custom puzzle for McCain foods was used in a team brainstorming session and has lots of “white space” for writing. This huge 5x20 foot puzzle is actually made up of 16 standard 20x30 magnetic puzzles which, when placed side by side create the overall image. Have another idea? All the above options were things our customers asked us to accomplish, so if you have an idea or need not addressed above please ask, we are pretty capable and creative and will give your idea our full consideration. Yes, you can combine Customization options above in many cases. 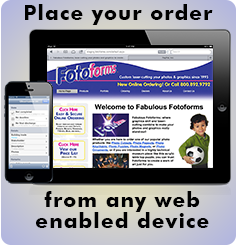 Thanks for looking at Fotoforms Custom Puzzle options! We look forward to working with you. 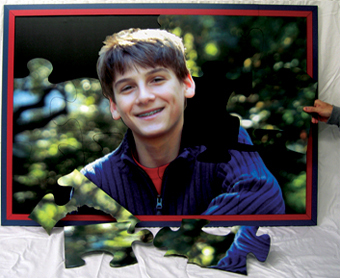 This 3x4 foot puzzle was made from our customer’s photo. 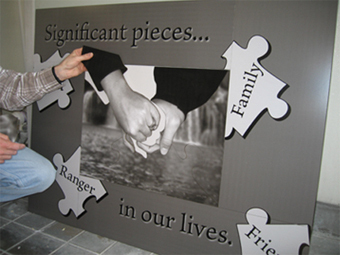 Fotoforms created this customized photo puzzle as part of a creative marriage proposal. Made for The Lincoln Museum. 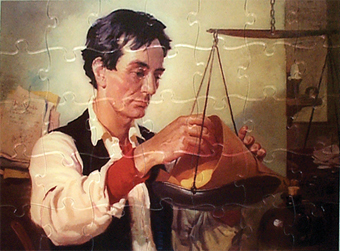 Two years after creating this custom puzzle, the museum tells us it still looks new.